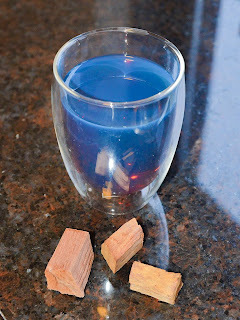 Now, I'm no stranger to tea, but this one called Palo Azul (literally "blue stick") that my friends in the Neths found in Guatemala piqued my interest, mainly because it makes you poop money was obtained through a mysterious tea witch and also turned blue when prepared. I asked them about this intriguing demon concoction -- which turns out to be a diuretic, and also used a cheap way of duping dope testing (especially useful for those avoiding military service conscription). Here's an excerpt of my interrogation session with Lin and François. Lin: When I went to visit Guatemala with my friend Nerea last October on holiday, we were relegated to indoor sight-seeing as the weather was horrible and somewhat dangerous, and we were apparently sitting ducks between two hurricanes in adjacent countries. We went to visit an indoor market in Antigua to find some Pericón tea, which I had had everywhere in Guatemala but couldn't find in the supermarkets. C: Did the tea witch have large fang-like teeth, googly eyes and smell like a retirement home? L: The smell of the tea witch was camouflaged by the smells of the rotten fruits and veggies of the stalls around her, not to mention the Mayan incense lit in her own stall. C: What convinced you that this was a good idea? Did the witch put a spell on you? L: It was probably the intrigue of the cubes and the way to prepare them. I did, however wait about five months before I felt it safe enough to try to try the tea. On that particular evening, we were at home with five people, including one physician. We applied a first-in-human procedure, in which one person drank the tea in sitting position, and maybe 15 minutes later, a second person drank the tea. The other three persons present were observers with a phone within reach. C: How did you prepare this tea? What did it tea taste like? F: Rather bland, considering how it looks. Think something between a neutral watery taste and some vague forest-floor flavour. It leaves a bit of film in your mouth. It's ever so slightly, subtly oily... And you know that blue stuff has to coat all your organs on the inside, right? C: Uh, okay... Did you have the urge to urinate frequently afterwards? F: It didn't make me rush to the pissoir... probably similar to regular tea in this regard (i.e. modest urge-inspiring effects). C: Did you pee blue? C: What did you start hallucinating after drinking the tea? 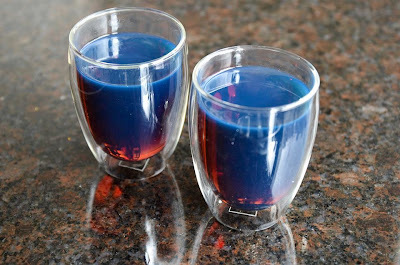 L: We actually believed the infusion looked blue! C I read that people drink this tea to help them pass drug tests... Was there any plans to join the army or navy or some other organization requiring clean urine samples? F: Hell, don't all boys? L: We still have some cubes left, and after having started doing clinical experiments, plant experiments would indeed be a very interesting next step to take. F: I just had another cup of this blue devil-witch drink a while ago, after letting it breathe (in a pot on the table top) for 2 days. I'm still breathing. I think they volunteered for the sake of science! i tried this and had hallucinations and it completely cleaned my bowels. i used 14 grams in 1 gallon boiled it for 2 hrs and it was not nearly this blue but clearly blue. passed a drug test the next day. So, the people trying this tea basically had nothing positive or negative to say about it. What, where hallucinating?